The husband-and-wife team of Patrick Sand and Tracy Record run WestSeattleBlog.com. She is the site’s primary reporter and editor, while he handles advertising sales and business development. Since January 2006, the pair have covered the bedroom community of West Seattle (over 65,000 residents) seven days a week, 365 days a year. They started selling ads about a year later. The site now has about 60 advertisers and brings in enough to support the couple and their teenage son, and to pay for occasional freelancers. Next on the agenda: hiring a Saturday editor so they get a day off. We spoke with Tracy earlier this week. What have you done to build your advertiser roster? We’re involved in the chamber of commerce; we joined more than a year ago. We sponsor a number of community events. It sounds mercenary, but there’s a lot of ways that you end up networking out of those. We run a banner on a local foot ferry to downtown Seattle. We offered a free seminar to help businesses interact with their customers on the web. It wasn’t an advertising pitch, we provided some basic information like setting Google alerts so you know if your business is being discussed someplace on the web. Way before you get to Facebook and Twitter, that’s something that a lot of people don’t really know a lot about. So, how much hand-holding do you end up doing with your advertisers? That’s my husband’s full-time job. He explains how this is going to work and how we’re going to build a relationship with the business. I have this disagreement with several people here—we don’t believe people are ready for self-service advertising yet. In some contexts they are, but a larger portion need service. I’m not being stupid like the travel industry that said people are always going to need travel agents. It’ll get to the point where people are ready for self-serve, but it isn’t there yet. We have learned over the year and a half to better explain to people upfront, before they ever make a commitment, what this is all about and how it might work for them. This is display advt, this is not click-through, this is not conversions. Overall, as the site gains more of an audience, it becomes something that people are proud of, they say I want to be part of WestSeattleBlog. Also, when people join, we offer them the chance to have a little advertorial story published, just a couple of paragraphs and a picture. We thought the most interesting reaction came from readers who say it helps them learn about local businesses they didn’t know were here. What is the big challenge, the big obstacle, you’d most like to get over? It’s been a struggle invoicing and we’ve just hired a part-time bookkeeper, because it’s clearly getting beyond something we can deal with ourselves. If you try to do that too, besides dealing with clients and covering the news, it just gets out of control. But, the next obstacle is finding additional advertising opportunities on the site without clutter. We’ve had inquiries about sponsoring certain parts of the site, but right now it would require some design work. We also want to be fair. We’ve set up a first come, first served positioning. And to say we’re adding a feature at the top of the page that is a sponsored traffic camera, do we need to tell all 60 advertisers that we have this opportunity and we’d like to offer it to all of you? Possibly, but it’s the same challenge that I’m sure our parents faced in running their small businesses. We’re at that point where you know you are going to have to broaden the fold, to bring in someone, whether its on the business side or a Saturday editor, and that person is going to have some thoughts and some ideas. You know it’s not going to be just your little thing anymore. We know that we’re at that point and we’re trying to figure out the right way to go about it. We feel blessed to get to that point. You’ve provided a deep dive into your editorial process elsewhere, but do you use citizen journalists to provide coverage of certain events? It’s a point of pride for us that we don’t ask people to do this volunteer, which even the local newspaper apparently does. If you’re going to write something for us then we’re going to pay you. So, if there’s something that needs news coverage that’s what we do, or we’ll pay a freelancer. When it comes to reporting something you saw, either crime reports or a little league game, we have a fair amount of that. But, what we don’t do is say “here’s an upload tool, come and give us your stuff automatically.” All of it is done with actual human contact or via email where we write back to say thank you or to ask follow-up questions. Great to see that they believe in paying their freelancers! @JohnWest – Journalism is hard work. Now that we are making money doing it, you bet we are going to pay the people we ask to help. Among the talented folks who have handled assignments for us lately is a veteran reporter, and West Seattle resident, who lost her job when the Post-Intelligencer bagged its print edition. I wish I could offer her fulltime work but we’re not quite there yet. West Seattle Blog’s business continues to be fascinating from all angles. Thanks for doing the interview, Tracy. So, about this self-serve advertising thing, don’t paint the argument as self serve = no service, no communication, just clicking and credit cards, etc. We added self-serve features to the advertising system on our http://neighborlogs.com service to enable one-person operations to get and stay in the game. If only we could ship a Patrick with every site! But we’ll be the first (or the second) to tell everybody that self-serve doesn’t mean you just sit back, cover great news and collect checks. The relationship you are fostering at WSB also has to be created and maintained. Putting good tools in place can help that. That’s very interesting, thanks for sharing your story guys. I run a community newspaper which covers North and Northeast Portland Ore. We have a fairly robust web service for a community monthly. It’s like running two news operations though. I’ve seen a lot of small news models in both web and print here in Portland. I find often these operations are family run; that is a married couple divide up the work. It’s often true of small business in general that a business requires more than one person to operate but the profits are too small to support two people- unless those people are sharing their own personal expenses. Good luck and congrats! 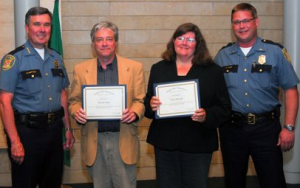 Congrats to the West Seattle Blog for their successes! It’s great to read these sorts of positive profiles amidst the drumbeat of doom and gloom. 1. Like many things in technology, self-serve ads in the local space is overestimated in the short-term and underestimated in the long-term. I’ve dealt with tons of small biz and most are still several steps away from being comfortable with online ads let alone self serve. 2. The “bridge” I see being viable for “self serve” is what I call the “publisher assist model” where the self serve tools are used by the publisher to enable ads more cheaply so they can serve small advertisers. That will work. As a Seattle area graphic designer, I’ll second the comment about it being nice to be willing to pay people who help you out.